So, we have our little food quirks. 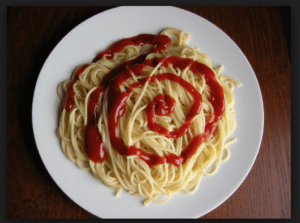 Aside from all the really weird stuff like fermented herring and smoked sheep’s head, we have little habits that other nations sometimes find a little, well, a little peculiar…. 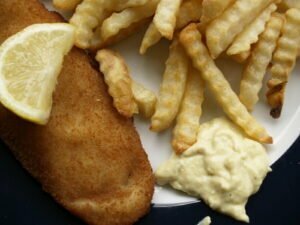 Especially cod roe, that is a huge favourite among Swedes and Norwegians. For breakfast. With boiled egg. 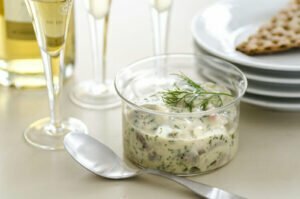 Danes especially love remoulade, a type of curried pickle mayonnaise sort of thing. Enjoy it with chips (nope, not ketchup), breaded fish, roast beef, on pate, on meatballs, on everything they can think of, actually. 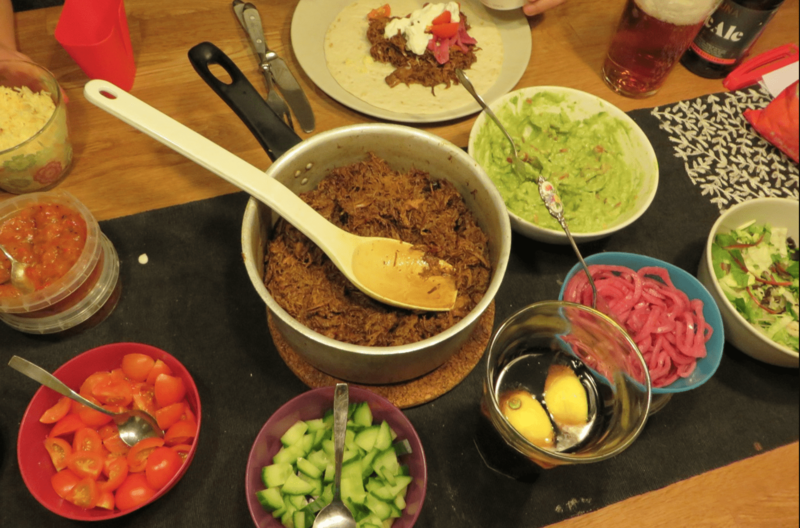 Scandinvians LOVE Tacos. It’s a Friday thing. For Swedes and Norwegians, it’s every Friday, too. Everything is referred to as Tacos, it’s so much easier than learning your burrito from your enchilada from your fajita. Just call it all Tacos. All of it. Even the nachos are called Tacos on Friday evenings. Also, must be served with chopped cucumber pieces (a combination somewhat strange to Mexico). 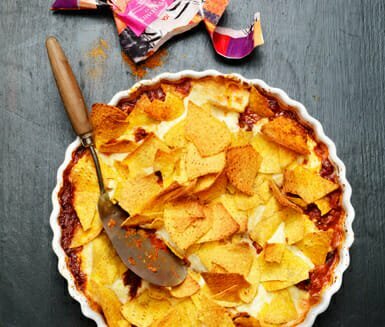 In Sweden, go one better and have Taco Pie. 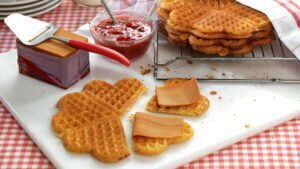 For breakfast, enjoy a nice treat of bread, cheese and a dollop of strawberry jam. It’s not a silly fad: It is our life. Live with it. 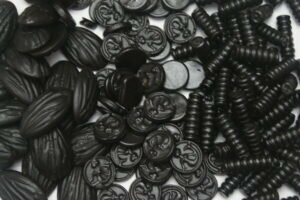 And we will ALWAYS try to make you taste it, only to find that you will never understand our love of salty, tar-like ‘sweets’. This is Danes only. A 38% alcohol drink, made from a secret blend of 29 herbs. 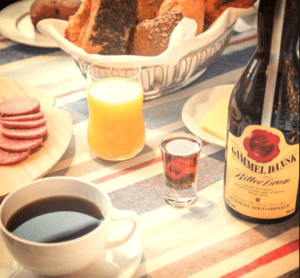 Danes like to drink this in shots. In the morning. With breakfast. Older Danes have a saying: ‘One shot for each leg’. …they have freshly baked waffles. 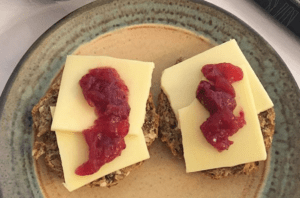 Topped with brown goats cheese – and jam. 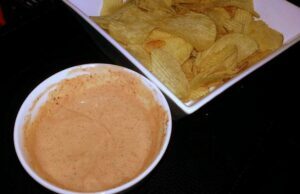 All our crisps (potato chips ) MUST be dipped in a sour cream dip dressing, usually named something exotic such as ‘holiday dip’. Every single crisp must be dipped. In Denmark, sometimes, crisps are served with the main meal. On the plate. Add gravy. Yes, it’s a real thing (but mainly for Christmas and Grandma’s birthday). Yes, even grown ups at times. We LOVE it. We need nothing more. Nope, we really don’t think it is weird to eat pickled herring on crispbread or rye bread. Ah, and the delicious Kebab Pizza. 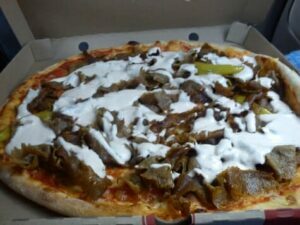 Pizza – topped with shavings of kebab meat – and dressing. 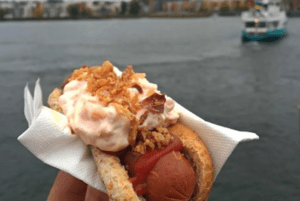 And in Sweden, the hotdogs are often topped with prawn mayonnaise. AND ketchup and mustard. 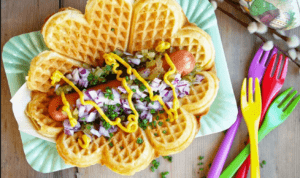 When in Norway, they have waffle hotdogs, too. Yes they do. – with jam. 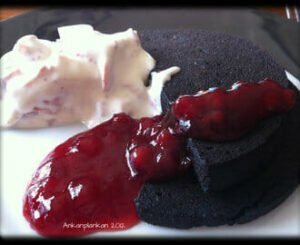 Lingonberry jam. It’s a thing. 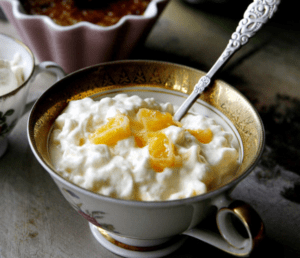 We all love a bit of cold rice pudding. 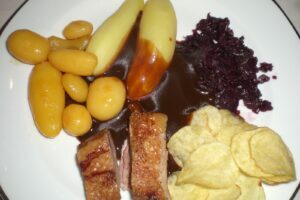 In Norway and Sweden topped with orange segments (especially those from a tin) – and cherry sauce in Denmark. We eat this for Christmas. 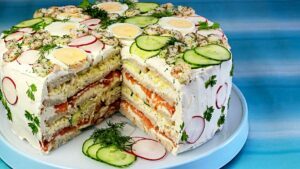 Back in Sweden, people eat Sandwich Cakes. Bread, mayo, filling of choice, bread, mayo, more filling, decorate with every shred of your imagination. Set. Slice. You’re the hero. We buy it in half kilo packages. Huge. 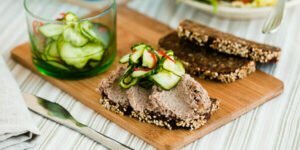 And then we add so much pickled cucumber on it you can’t taste the pate (get some here). 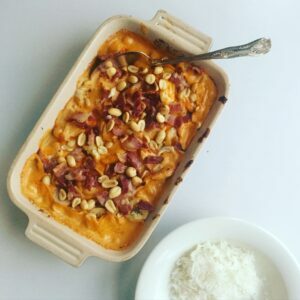 The Swedish Dish that people are often not quite sure is actually real – but it is: Chicken baked with cream, curry, chilli ketchup, bananas… Then topped with bacon bits and peanuts. Serve with rice. Open sandwiches don’t seem to strange now, eh?